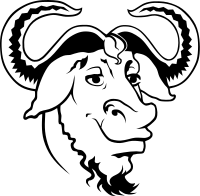 GNU Free Documentation License（GNU FDL或簡稱GFDL）係一個反版權嘅授權，畀自由文件用嘅。佢由Free Software Foundation（FSF）創造，for the GNU project. It is the counterpart to the GNU GPL that gives readers the same rights to copy, redistribute and modify a work and requires all copies and derivatives to be available under the same license. Copies may also be sold commercially, but if produced in larger quantities (greater than 100) then the original document or source code must be made available to the work's recipient. 呢個條款explicitly separates從"Secondary Sections"變成任何類型嘅「文件」，which可能唔integrated with the Document, but exist as front-matter materials or appendices. Secondary sections can contain information regarding the作者或者印刷者relationship to the subject matter, but not any subject matter itself. While the Document itself is wholly editable, and is essentially covered by a license equivalent to (but both-ways incompatible with) the GNU General Public License, some of the secondary sections have various restrictions designed primarily to deal with proper attribution to previous authors. GFDL requires the ability to "copy and distribute the Document in any medium, either commercially or noncommercially" and therefore is incompatible with material that excludes commercial re-use. Material that restricts commercial re-use is incompatible with the license and cannot be incorporated into the work. However, incorporating such restricted material may be fair use under United States copyright law and does not need to be licensed to fall within the GFDL if such fair use is covered by all potential subsequent uses.一個例子係of such liberal and commercial fair use is parody. The Debian project and Nathanael Nerode have raised objections. Debian developers eventually voted to consider works licensed under the GFDL to comply with their Debian Free Software Guidelines provided the invariant section clauses are not used. These critics recommend the use of alternate licenses such as the share-alike Creative Commons licenses, the BSD Documentation License, or even the GNU GPL. They consider the GFDL a non-free license. The reasons for this are that the GFDL allows "invariant" text which cannot be modified or removed, and that its prohibition against digital rights management (DRM) systems applies to valid usages, like for "private copies made and not distributed". A GNU FDL work can quickly be encumbered因為a new, different, title must be given and a list of previous titles must be kept. This could lead to the situation where there are a whole series of title pages, and dedications, in each and every copy of the book if it has a long lineage. These pages cannot ever be removed, at least not until the work enters the public domain after copyright expires. The GNU FDL requires that licenses, when printing a文件covered by the license, must also include "this License, the copyright notices, and the license notice saying this License applies to the Document".咁樣表示咗如果一篇文licensee prints out a copy of an article whose text is covered under the GNU FDL, he or she must also include a copyright notice and a physical printout of the GNU FDL, which is a significantly large document in itself. The definition of a "transparent" format is complicated, and may be difficult to apply. For example, drawings are required to be in a format that allows them to be revised straightforwardly with "some widely available drawing editor." The definition of "widely available" may be difficult to interpret, and may change over time, since, e.g., the open-source Inkscape編輯者is rapidly maturing, but has not yet reached version 1.0. This section, which was rewritten somewhat between versions 1.1 and 1.2 of the license, uses the terms "widely available" and "proprietary" inconsistently and without defining them. According to a strict interpretation of the license, the references to "generic text editors" could be interpreted as ruling out a format used by an open-source word-processor such as Abiword; according to a loose interpretation, however, Microsoft Word .doc format could qualify as transparent, since a subset of .doc files can be edited perfectly using OpenOffice.org, and the format therefore is not one "that can be read and edited only by proprietary word processors." The FDL was released in draft form for feedback in late 1999. After revisions, version 1.1 was issued in March 2000, and version 1.2 in November 2002. The current state of the license is version 1.2. 其中一啲developed independently of the GNU FDL, while others were developed in response to perceived flaws in the GNU FDL.